In the 1700s several families journeyed from Scotland, via Ireland, North Carolina, Cincinnati and eventually settled just South of Palestine, Illinois. These families built new homes, farms, and a community. Not many people can claim to live and work on the same land their ancestors did, but John, Mark and David all can. This farm is more than just a piece of land, it’s where the entire Shaw clan learned to walk, work and play. 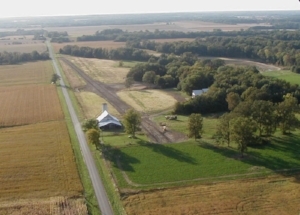 For the last few decades the majority of the 500-acre Shaw family farm has been used to grow row crops like corn and soybeans. Good stewardship of the land has always been taken seriously and has been recognized by various conservation awards. Several years ago, grass farming was identified as an even more sustainable agricultural model. Cows had always been a part of the farm-scape, but only raised for personal use. Producing grass-fed beef complemented a desire to return to “real farming” where farmers produce quality food for their community. Excellent pasture is essential in raising good quality beef, therefore much research was conducted to discover the best farming practices. 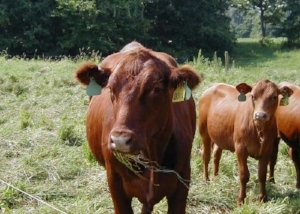 Taking advice from experts such as Joel Salatin and Allan Nation, management intensive grazing practices have been adopted. Rotational grazing divides the pasture into smaller sections rather than allowing unrestricted access. This is beneficial for the pasture because it gets a chance to rest and regenerate and the cows benefit from always eating young lush green grass. Flying S currently raises South Polls and a cross between Longhorn and Herefords. After researching a variety of grass fed cow breeds, a herd of South Polls was purchased from Teddy Gentry’s Bent Tree Farms in Alabama. South Polls are a four way cross between Hereford, Red Angus, Senepol, and Barzona and have been specifically bred for their tenderness. DNA and ultrasound testing was performed on the entire herd to ensure meat is of a superior quality. Herefords have always been regarded highly in the Shaw family as a good solid beef cow. Longhorns are known for having lean and tender meat plus they are comparatively little work and great mothers. The combination of these two breeds has been quite successful and has resulted in consistently high quality beef. All Flying S cows enjoy a “salad bar” of red and white clover, orchard and rye grass from the time they are born. Their diet does not include any grain and calves are nurtured on their mother’s milk. Every day or so cows are rotated into a new section of pasture. When the weather is especially harsh, the animals are given stored forages such as hay. Penny Shaw on the Farm. The goal of Flying S is to provide its neighbors with delicious tender beef, raised naturally on grass pastures free from pesticides, hormones, antibiotics and GMO’s. The industrialized model of farming that has replaced small farmers has brought inhumane treatment of animals, stink and disease problems leading to lower quality meat on the table. We want to provide a much better alternative to the feedlot beef you can buy at the supermarket. It just doesn’t make sense to feed Illinois corn to cows in Colorado that will eventually be sold as hamburgers back in Illinois. Let the cows feed themselves on lush pasture. It’s better for the cows, the environment, the rural community and of course the consumer.